British Airways flies out of Nice Airport to London Gatwick and London Heathrow from Nice Terminal 1. 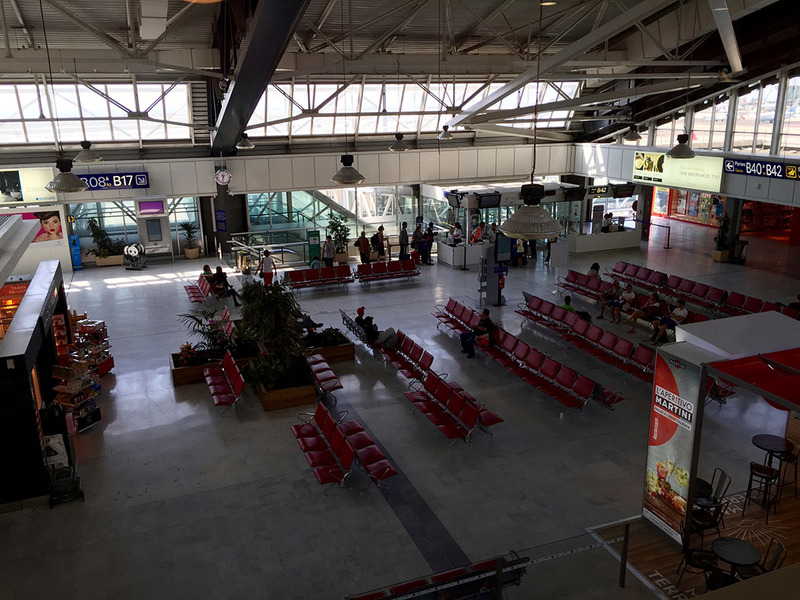 There is a Priority Pass VIP lounge ideally located just above the international departure gate for these British Airways flights as well as an Emirates flight to Dubai which also goes around 2pm from these gates from Nice Airport. 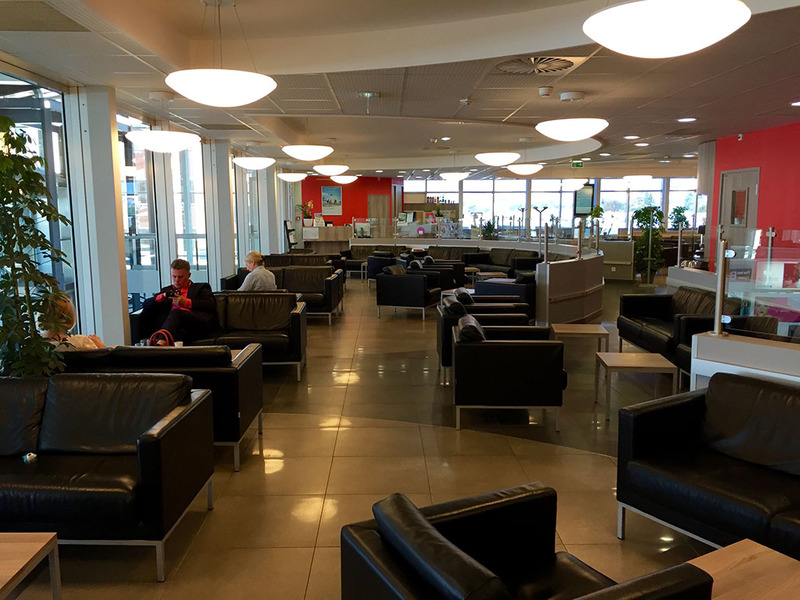 This is the lounge that British Airways Business Class passengers get access to at Nice airport. 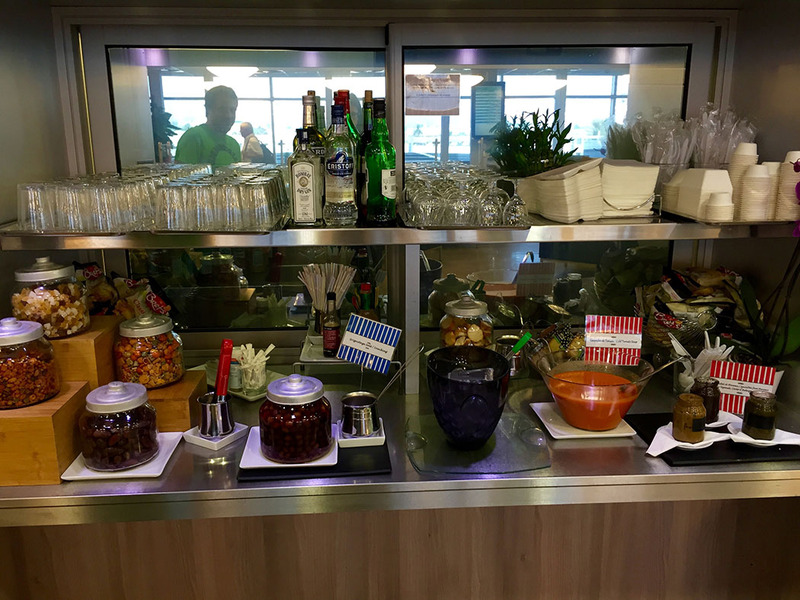 You can read all my British Airways airport lounge reviews. 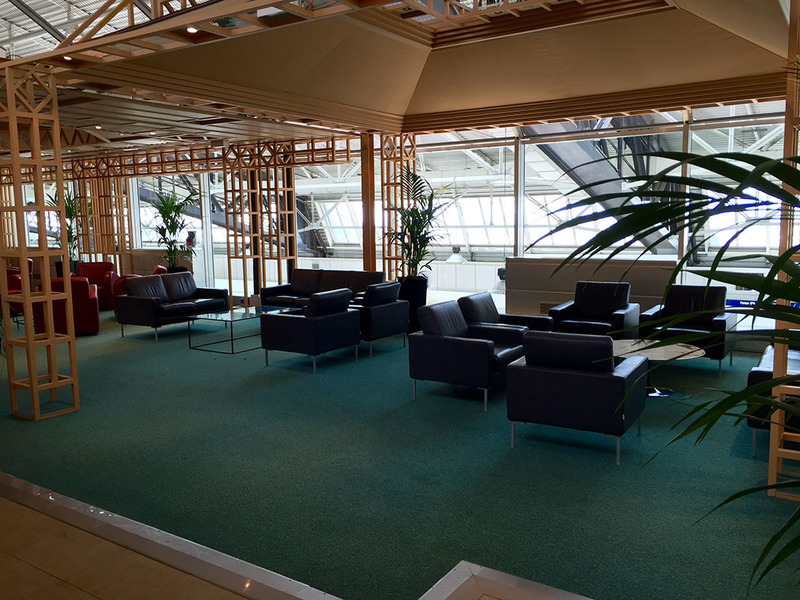 This airport lounge is reached by a glass lift or stairs in international departures in Nice Terminal 1 and is a floor above the departure gate. It has comfy seats which are set by floor to ceiling glass windows overlooking the departure area. I have taken photos showing how the seats are set by these windows and also of the view from the lounge to show how easy it is to see the gates. Food and drink (also pictured) includes some pretty tasty sandwiches (last time cheese and salad and chicken and salad rolls), pizza, yoghurts, loads of nutty nibbles and crisps, cans of whatever you fancy, some alcoholic options and tea, coffee, and a large variety of fruit and sweet biscuits. There is also a selection of usually rather mangled newspapers and Cote D’Azur property magazines. 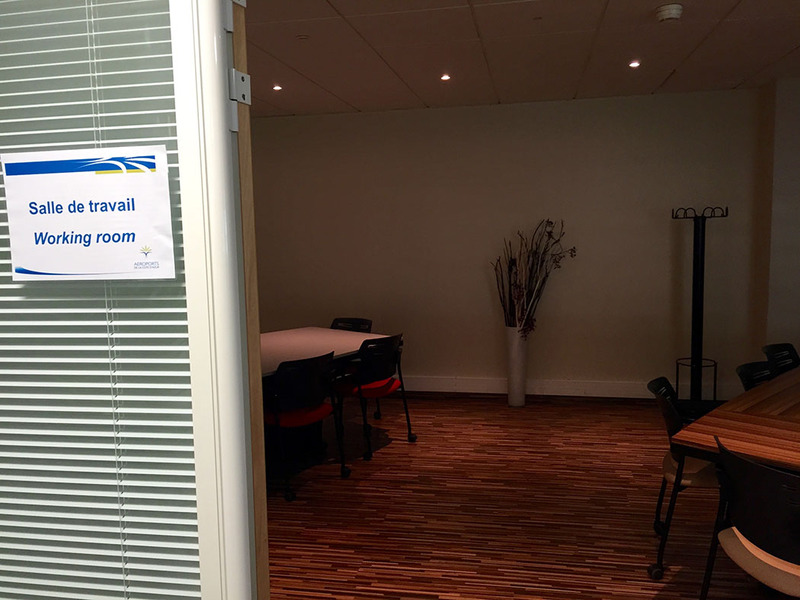 Recently the lounge has been extended to include an additional lounge which you can see in the picture with green carpet and a rather basic meeting room. Neither has the view down to the departure gate so aren’t much of an addition to the lounge facilities in my opinion. The best thing about the lounge it its location. You can sit in the lounge and watch people queue up for your flight, knowing that you are just moments away from the boarding gate, whilst still being comfort of the lounge. When the queue goes down you can pounce thus avoiding the pain of waiting in line. 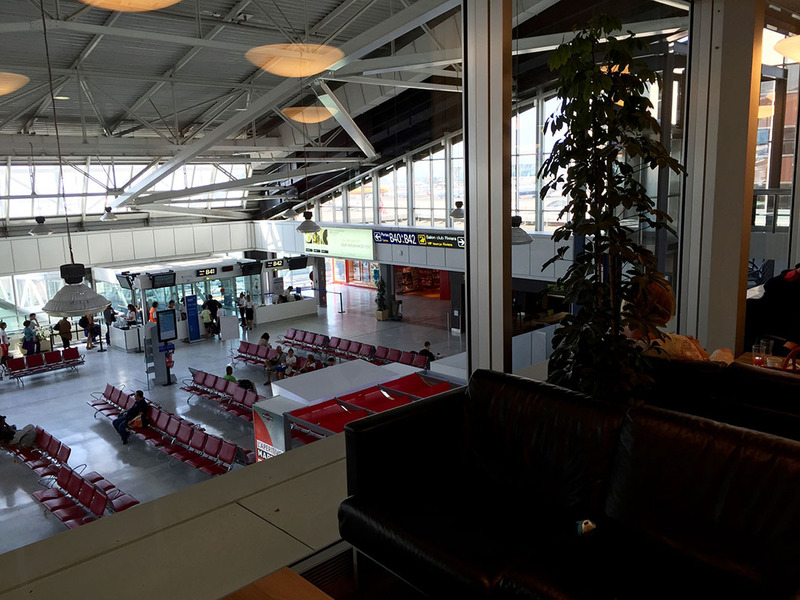 It is one of the few lounges that you really can leave it to the last minute before boarding. This is a small and intimate lounge in possibly the perfect location to get ready to depart for your flight. On location alone, this is one of my favourite airport lounges, I also happen to like the sandwiches. 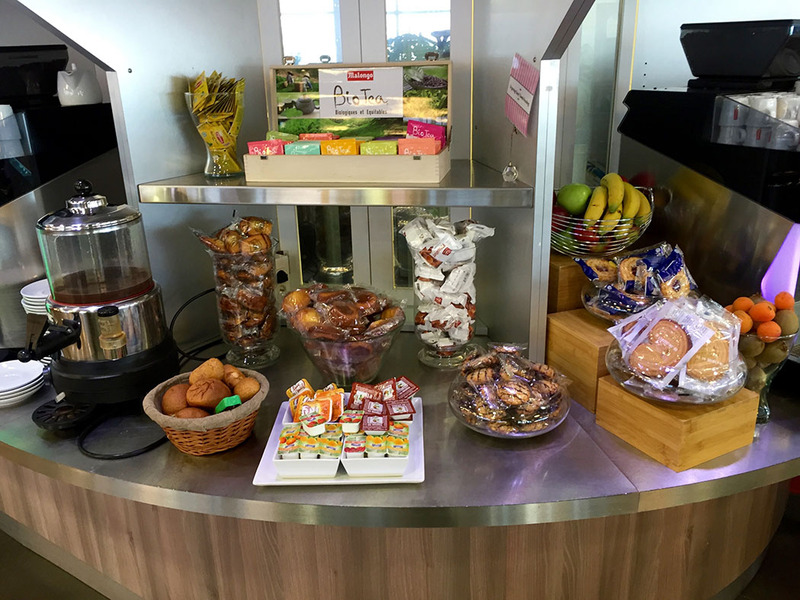 I access this lounge with my complimentary Priority Pass that I get with my Platinum Amex.